At the near end of the Chanel show, enter two models wearing bridal Haute Couture, holding hands, a kid by their side. Meaning? Karl Lagerfeld sent a strong message in support of “le marriage pour tous” in France or the legalization of gay marriage. The current French president Francois Hollande is meaning to pass this law at court and he doesn’t seem preoccupied by the revolution that was held in the Champs de Mars. A round of applause has greeted the model wearing Elie Saab bridal dress. It was obvious how all the front row people were leaning towards the catwalk to get a photo from their phones. This dress was said to be inspired by the Elizabethan era, yet, personally I feel that there is more of something Lebanese to it. 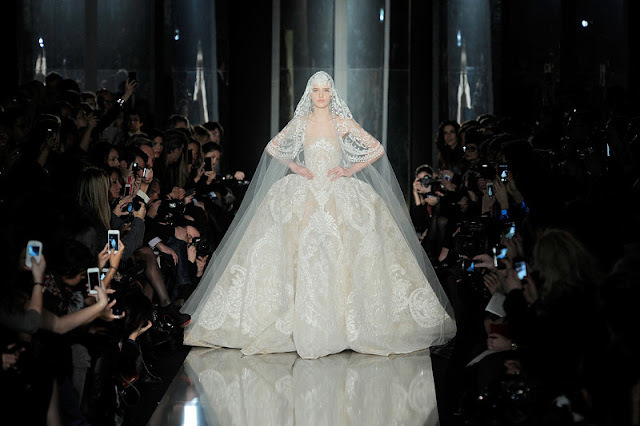 Last but not least, the bridal statement that I enjoyed above all is that of Jean Paul Gaultier. When the model stepped into the catwalk, she lifted her skirt and unveiled four little Indian girls that ran the catwalk applauding the designer. Her bridal outfit was stunning, inspired by the central theme of his Haute Couture show, the gypsies and India. Model wearing bridal Haute Couture posing with designer Jean Paul Gaultier.